Our team of specialists and staff believe that informed patients are better equipped to make decisions regarding their health and well being. For your personal use, we have created an extensive patient library covering an array of educational topics. For new information check out the link to our Blog, Facebook page and Twitter at the bottom of the page. Browse through these diagnoses and treatments to learn more about topics of interest to you. Or, for a more comprehensive search of our entire Web site, enter your term(s) in the search bar provided. A wart is a small growth on the skin that develops when the skin is infected by a virus. Warts can develop anywhere on the foot, but typically they appear on the bottom (plantar side) of the foot. Plantar warts most commonly occur in children, adolescents, and the elderly. A solitary wart is a single wart. It often increases in size and may eventually multiply, forming additional “satellite” warts. Mosaic warts are a cluster of several small warts growing closely together in one area. Mosaic warts are more difficult to treat than solitary warts. Plantar warts are caused by direct contact with the human papilloma virus (HPV). This is the same virus that causes warts on other areas of the body. Thickened skin. Often a plantar wart resembles a callus because of its tough, thick tissue. Pain. Walking and standing may be painful. Squeezing the sides of the wart may also cause pain. Tiny black dots. These often appear on the surface of the wart. The dots are actually dried blood contained in the capillaries (tiny blood vessels). 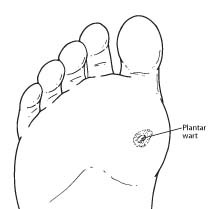 Plantar warts grow deep into the skin. Usually this growth occurs slowly, with the wart starting small and becoming larger over time. To diagnose a plantar wart, the foot and ankle surgeon will examine the patient’s foot and look for signs and symptoms of a wart. Although plantar warts may eventually clear up on their own, most patients desire faster relief. The goal of treatment is to completely remove the wart. The foot and ankle surgeon may use topical or oral treatments, laser therapy, cryotherapy (freezing), acid treatments, or surgery to remove the wart. Regardless of the treatment approaches undertaken, it is important that the patient follow the surgeon’s instructions, including all home care and medication that has been prescribed, as well as follow-up visits with the surgeon. Warts may return, requiring further treatment. If there is no response to treatment, further diagnostic evaluation may be necessary. In such cases, the surgeon can perform a biopsy to rule out other potential causes for the growth. Although there are many folk remedies for warts, patients should be aware that these remain unproven and may be dangerous. Patients should never try to remove warts themselves. This can do more harm than good.